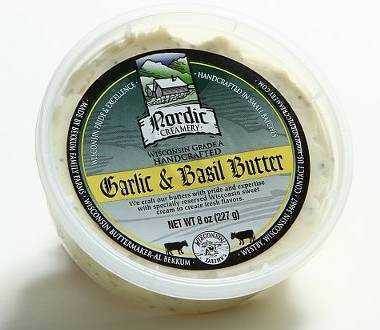 Garlic and Basil Butter is made from our outstanding Nordic Creamery organic butter with the addition of dried basil and garlic. Silver Medal winner at the 2017 US Championship Cheese Contest. This butter is a real treat for cooks short on time or fans of Italian bread. Just spread it on your bread, toast it a bit and it is ready for dinner in a jiff! Also try our Garlic and Basil Butter on your favorite pasta, like Orzo, to make a quick simple side dish. Nordic Creamery’s all-natural organic butter is certified rBGH free, and is made using cow milk from Wisconsin cows raised on natural grasses and feeds. Bought this butter and a lot of cheese last week on a trip to Wisconsin. My new favorite food is a grilled cheese made with Nordic Creamerys garlic & basil butter and white cheddar cheese!!! Fantastic!! Service Area: Westby, La Crosse, Richland Center, Holmen, West Salem, La Crescent, Madison, Stevens Point, Appleton, Rhinelander, Eau Claire and surrounding communities.